PORSCHE will go all-out for victory in the 2018 Liqui-Moly Bathurst 12 Hour, confirming a factory-supported team will contest the race next February. Dirk Werner, Romain Dumas and Fred Makowiecki were announced as the factory combination to lead Porsche’s Intercontinental GT Challenge campaign next year, meaning they will contest Bathurst alongside the three other rounds including the Spa 24 Hour, Suzuka 10 hour and California 8 Hour. Confirmation of Porsche’s expanded commitment to GT3 racing came at the annual ‘Night of Champions’ event held in Germany on the weekend. 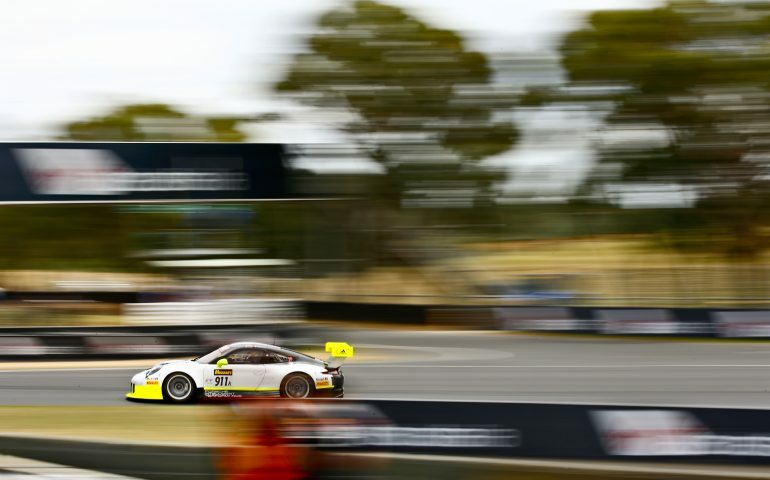 Though not yet confirmed, the trio are expected to drive a Walkinshaw Racing-prepared GT3-R – following the ICGT model of manufacturers using locally-based teams at each event. Walkinshaw made their 12-Hour GT debut this year with a pair of GT3Rs, one finishing fourth and first in the ‘Am’ division with John Martin, Liam Talbot and Duvashen Padayachee behind the wheel. The factory trio are expected to be major contenders given their experience in long-distance racing. Werner, from Germany, has more than a decade’s experience in Porsche endurance racing and is a two-time class winner of the Grand-Am Series in the USA. 39-year-old Dumas is a three-time winner of the LeMans 24 Hour and won the 2016 World Endurance Championship with Porsche. Makowiecki is similarly experienced with wins to his credit in the WEC, GT1 World Championship and Carrera Cup championships. 2017 marked the debut of the 991 GT3R at Mount Panorama and it proved instantly competitive. As well as the two-car Walkinshaw team, the privately-entered car run by Competition Motorsports / McElrea Racing finished second outright, showing the race-winning potential of the car. Porsche has stepped up their GT3 campaign for 2018 following their withdrawal from the LMP1 class of the World Endurance Championship and the LeMans 24 Hour, with a two-car campaign in the Blancpain GT Endurance Championship part of their expanded program. Up to nine GT3Rs will contest the Nurburgring 24 Hour, two factory Manthey Racing-run cars to be joined by a host of privateer entries. Porsche’s ‘young professionals’ driver squad, including Matt Campbell, are expected to be in one of the cars at the famed German event. Campbell’s 12-hour plans are yet to be confirmed. Competition Motorsport and Black Swan Racing have already confirmed they will also run Porsche GT3R entries in the February 2-4 event.